Tarpon fishing had been pretty good this last week, depending on the weather, Yesterday was tough.. we had lots of cloud cover, which makes it tough to sight fish.. However we finished up the day with a bunch of shots at laid up tarpon, floating near the surface in 81 degree water.. One even ate a toad fly..
Today started with solid cloud cover,, twilight zone, Rod sterling, cloud cover... Tarpon are more inclined to roll in low light situations.. 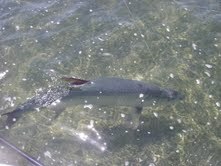 I had spin anglers today and we put three tarpon in the air with live bait and plugs in a channel.. When the clouds left, we switched to sight fishing the flats for permit and cudas.. Got a bunch of shots at both.. The reports from some of my other friends were the same.. My buddy Jack Teauge had the day off and got a tarpon on fly today fishing with Dale Bishop Good Job Guys! The only other report was from my friend Bob Bieghly who got three tarpon today too!! Bob emailed me this photo, taken with his cell phone.. NICE!! !